Tetanus is a rare but often fatal disease that affects the central nervous system by causing painful and often violent muscular contractions. The earliest descriptions of the disease can be found in the medical papyri of ancient Egypt. 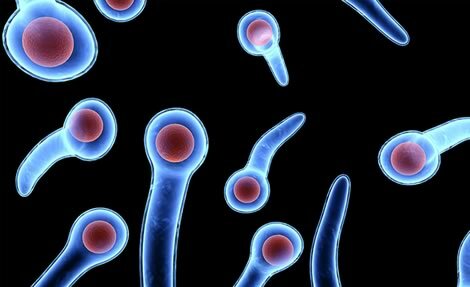 The disease begins when the tetanus bacterium (Clostridium tetani) enters the body, usually through a wound or cut that has come in contact with the spores of the bacterium. Tetanus spores are commonly found in soil, dust, and animal manure. Tetanus is a noncommunicable disease, meaning that it cannot be passed directly from one person to another. Tetanus is uncommon in the United States, with nearly all cases occurring in adults who were not vaccinated as children, or in those who have not had a booster vaccination in 10 years. In the United States, there are between 50 and 100 reported cases of tetanus a year. About 30% of cases are fatal. Most people who die of tetanus infections are over 50 years old. Tetanus causes convulsive muscle spasms and rigidity that can lead to respiratory paralysis and death. It is sometimes called “lockjaw” because one of the most common symptoms is a stiff jaw that cannot be opened. Sometimes tetanus is localized, that is; it affects only the part of the body where the infection began. However, in almost all reported cases, tetanus spreads to the entire body. The incubation period from the time of the injury until the first symptoms appear ranges from five days to three weeks. Symptoms usually occur within eight to 12 days. The chance of death is increased when symptoms occur early. Tetanus is caused by a bacterium called Clostridium tetani, whose spores (the dormant form) are found in soil, street dust, and animal feces. The bacteria enter the body through cuts and abrasions but will multiply only in an environment that is anaerobic, or oxygen-free. Deep puncture wounds and wounds with a lot of dead tissue provide an oxygen-free environment for the bacteria to grow. As C. tetani grows, it excretes a highly poisonous toxin called tetanospasmin into the bloodstream, spreading it throughout the nervous system. The infection is usually transmitted through deep puncture wounds or through cuts or scratches that are not cleaned well. Many people associate tetanus with rusty nails and other dirty objects, but any wound can be a source. Less common ways of getting tetanus are animal scratches and bites; surgical wounds; dental work; punctures caused by glass, thorns, needles, and splinters; and therapeutic abortion. Rare cases have been reported in people with no known wound or medical condition. Neonatal tetanus in newborns can be caused by cutting the umbilical cord with an unsterile instrument or by improper care of the umbilical stump. Neonatal tetanus is less common in developed countries. Tetanus toxin affects the nerve endings, causing a continuous stimulation of the muscles. Initial symptoms may include restlessness, irritability, a stiff neck, and difficulty swallowing. In about half of all cases, the first symptom is a stiff or “locked” jaw, which prevents patients from opening their mouths or swallowing. This symptom is also called trismus and results in a facial expression called risus sardonicus, which is a Latin phrase meaning “sardonic smile.” Trismus is often followed by stiffness of the neck and other muscles throughout the body as well as uncontrollable spasms. Sometimes these convulsions, known as opisthotonos, are severe enough to cause broken bones. Other symptoms of tetanus include loss of appetite and drooling. People with localized tetanus experience pain and tingling only at the wound site and spasms in nearby muscles. In the underdeveloped world, neonatal tetanus accounts for about one-half of tetanus deaths and is related to infection of the umbilical stump in a baby born of an unimmunized mother. In many cases the risk is increased by the mother’s giving birth on a floor made of hard-packed soil. Worldwide, 800,000 children die of tetanus each year. 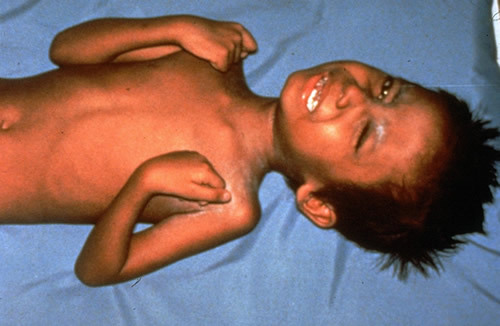 Tetanus is diagnosed by the clinical symptoms and a medical history that shows no tetanus immunization. Early diagnosis and treatment is crucial for recovery. In general, the shorter the incubation period, the more severe the disease. As traditional medical treatment revolves around drug therapy, traditional Chinese medicine herbal remedies are the most common alternative treatment for tetanus. Herbs that have sedative effects should be given to reduce the frequency of convulsions, along with herbs to fight the bacteria. Tetanus and convulsions can be treated with a concoction made from the dried body of a long-nosed pit viper, called this drug Qi She in Mandarin. Chan Tui, or cicada slough (the skin the cicada sheds) is also helpful. Also helpful are the dried root of the Saposhnikovia divaricata, called divaricate saposhnikovia root, and jackin-the-pulpit tuber, if it is treated to remove toxins. There are several alternative treatments aimed at prevention of the disease. Tetanus is a life-threatening disease. Patients diagnosed with it are usually hospitalized, usually in an intensive care ward. Treatment can take several weeks and includes antibiotics to kill the bacteria and shots of antitoxin to neutralize the toxin. It also includes antianxiety drugs to control muscle spasms or barbiturates for sedation. In severe cases, patients are placed on an artificial respirator. Recovery can take six weeks or more. After recovery, since the levels of circulating toxin are quite low, the patient must still be adequately immunized against this disease. Full recovery is common in patients who can be kept alive during the most violent portion of the attacks. Yet up to 30% of tetanus victims in the United States die. Early diagnosis and treatment improves the prognosis. Neonatal tetanus, however, has a mortality rate of more than 90%. Castor oil is a natural remedy that can be used to clean out a wound and prevent tetanus. When a wound is sustained, a cotton ball dunked in castor oil should be placed on the wound, and then fixed on the wound with a bandage. Castor oil has tremendous drawing power and can pull out rust and other infectious agents. The dressing should be changed every two hours the first day of treatment and twice a day for the next three days. Tetanus is easily preventable through vaccination. All children should have a series of five doses of DTaP, a combined vaccine that offers protection against diphtheria, tetanus, and pertussis, before the age of seven. 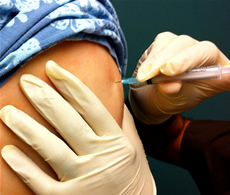 This measure is supported by numerous organizations, including the World Health Organization, the Centers for Disease Control and Prevention, the Advisory Committee on Immunization Practices, the Committee on Infectious Diseases of the American Academy of Pediatrics, and the American Academy of Family Physicians. Children in the United States will not be admitted to school without proof of this and other immunizations. The DTaP vaccine should be given at ages two months, four months, six months, 15-18 months, and four to six years. DTaP is the preferred vaccine for children up to the age of seven in the United States; it has fewer side effects than DTP and can be used to complete a vaccination schedule begun with DTP. DTaP was first approved by the Food and Drug Administration in September 1996. In December 1996, it was approved for use in infants. Between age 11 and 13, children should have a booster, called Td, for diphtheria and tetanus. Adults should have a Td booster every 10 years. Statistics from the Centers for Disease Control and Prevention show that fewer than half of Americans aged 60 and older have antibodies against tetanus. The Centers for Disease Control and Prevention suggests that adults be revaccinated at mid-decade birthdays (for example, at 45). Adults who have never been vaccinated against tetanus should get a series of three injections of Td over six to 12 months and then follow the 10-year booster shot schedule. Side effects of the tetanus vaccine are minor: soreness, redness, or swelling at the site of the injection that appear any time from a few hours to two days after the vaccination and disappear in a day or two. Rare but serious side effects that require immediate treatment by a doctor are serious allergic reactions or deep, aching pain and muscle wasting in the upper arms. These symptoms could start from two days to four weeks after the shot and could continue for months. For those who are averse to immunizations, tetanus immunity can be boosted naturally by taking vitamin E, according to a study from Tufts University in Medford, Massachusetts. To get the most benefit, 200 mg should be taken daily. Keeping wounds and scratches clean is important in preventing infection. Since C. tetani grows only in the absence of oxygen, the wounds must be adequately cleaned of dead tissue and foreign substances. Run cool water over the wound and wash it with a mild soap. Dry it with a clean cloth or sterile gauze. To help prevent infection, apply an antibiotic cream or ointment and cover the wound with a bandage. Try the castor oil remedy. The longer a wound takes to heal, the greater the chance of infection. Consult a doctor if the wound doesn’t heal, if it is red or warm, or if it drains or swells. If the wounded individual does not have an adequate history of immunization, a doctor may administer a specific antitoxin (human tetanus immune globulin, TIG) to produce rapid levels of circulating antibody. The antitoxin is given at the same time as a dose of vaccine but at a separate site. Some persons will report a history of significant allergy to “tetanus shots.” In most cases, the reaction occurred in the remote past and was probably caused by antitoxin derived from horse serum. More recently, however, the use of aluminum as an adjuvant, or substance added to a vaccine to increase the body’s immune response, has been associated with skin eruptions and swelling in hypersensitive individuals. In some cases, these persons can be safely vaccinated for tetanus with a graduated series of shots. Adverse reactions of any kind to tetanus vaccine should be reported to the Center for Biologics Evaluation and Research (CBER) of the Food and Drug Administration (FDA).